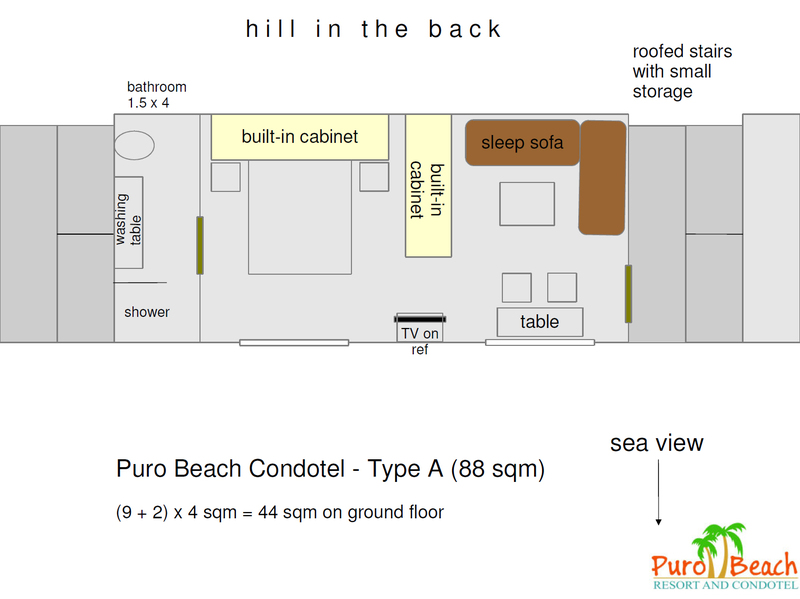 Whether Filipino or foreigner – you can very easily own your condotel unit on Puro Beach, fully managed by us. You may use it by yourself as long and often as you wish and in your absence you can add it to the rental pool and earn additional income without any effort. 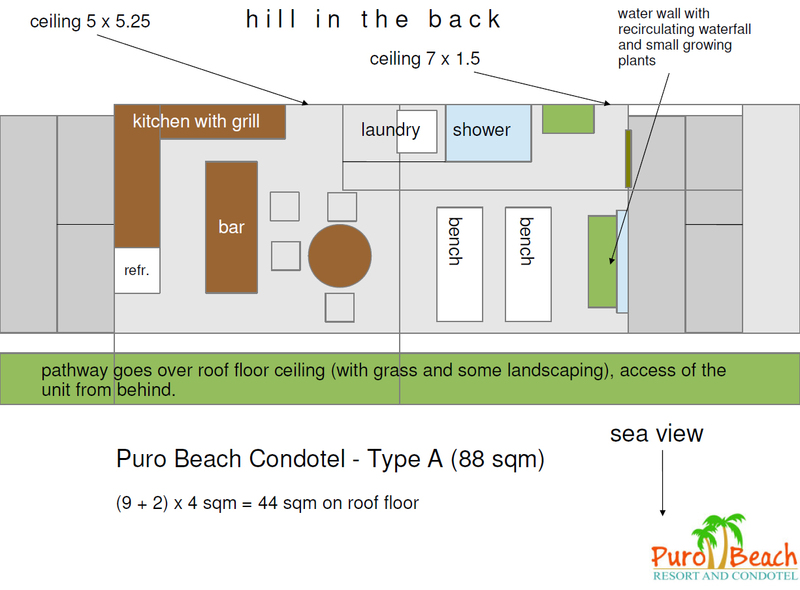 Puro Beach Condotel offers one of the best condotel plans you will probably ever have heard of: Unlimited use by yourself and attractive income sharing in case of renting out, combined with very reasonable management fees – at really affordable rates. Our beautiful and tasteful luxury condotel units with unobstructable overlooking sea view have a standard floor area of 88 sqm in two storeys (Condo Type A). Larger individual sizes can be designed by our architect for you on request. In the ground floor you’ll find the living room, bedroom and marbled bathroom. As the living room has an extendable sofa bed, the unit is ideal for families. The second floor hosts the open kitchen and bar with open dining space, also a laundry area, further shower and open area with benches for sun lovers. Our promo: If you reserve your unit in 2013 and order it until 31 January 2014, you save P880,000 (about $ 22,000 resp. 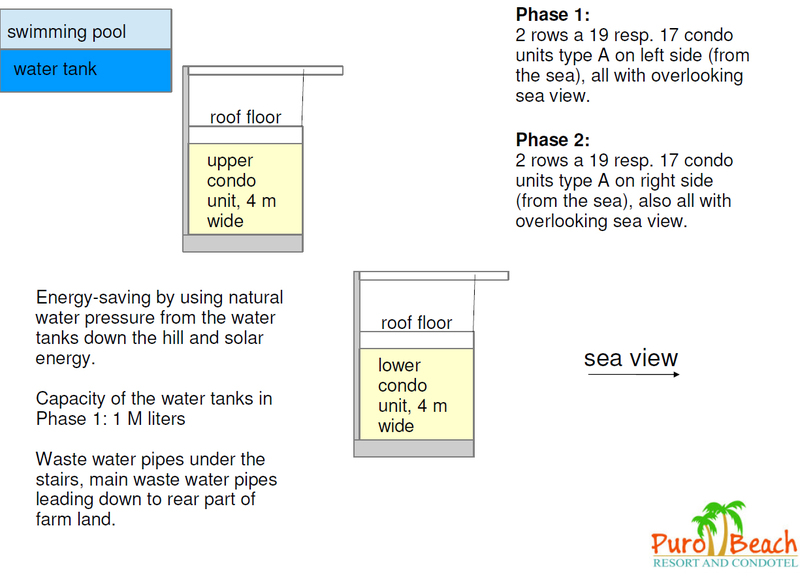 EUR 16,000) on the regular price and benefit from the promo price of only P 4.4 M (about $ 100,000 resp. EUR 80,000). Afterwards, the regular sales price per unit will be P 5,280,000 (about $ 120,000 resp. EUR 97,800). The reservation fee (up to 3 months) is as low as P 100,000 (about $ 2,270 resp. EUR 1,850) and fully counts on your downpayment of 50 %. Ask for our attractive payment.